I’m back on the Song of Leira release blog tour to share my review! And also some snazzy photos I took for Gillian’s Take Your Book on an Adventure photo contest (details at the end of this post — but it ends in just a couple of days, so be sure to get in on it!). I took Song of Leira on an adventure to the Creation Evidence Museum, and the Dinosaur Valley State Park with dinosaur footprints in the riverbed (both in Glen Rose, TX), so that’s where these pictures scattered through the post are from! Fave character: GAH. How can I pick? Cade, Birdie, Ky, Amos, Gundhrold… so there. Notes: I received a free ARC of this book from the publisher (thanks!) and was not required to write a positive review. These opinions are entirely my own. The sweeping, epic conclusion to the Songkeeper Chronicles trilogy, SONG OF LEIRA far exceeded my expectations and does not disappoint! AAHH! My heart is so full. ^_^ *hugs book* I’m not using “epic” lightly—it really is that. I haven’t read a book with such overwhelming hope in a long time. Yes, there’s darkness and war and death and sorrow, but in the midst of it, the light and the Song pour out hope and peace and strength. It’s full of those times when you feel like everything’s lost, but then there are moments of eucatastrophe and those good surprises (particularly near the end!) that make everything right. I also loved following Birdie and Ky on their journeys, as they fall and get up again over and over—as they doubt and find their way, and make mistakes and grow and learn, and become so much more than they could have imagined. Becoming heroes worthy of legend and song. And Gundhrold the griffin and Amos and—gaah, I love them all! 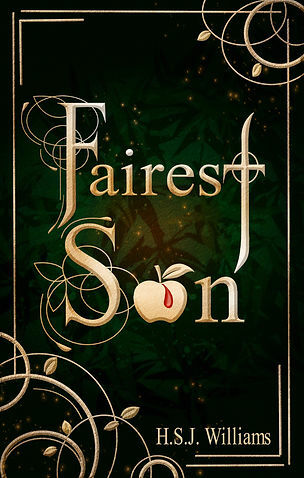 There are new characters too—I particularly love Frey, the beast from the cover! All the characters are so HUMAN (I mean… except for the actual non-human characters. *cough* But you know what I mean!) and we bleed and struggle and triumph along with these broken but determined souls. I love them so much! ^_^ These are definitely some characters who’ve wrapped themselves around my heart. (Yes, including Cade. He may be arrogant at times, but I still love him! He wasn’t in it much, but I was so glad he got to come in near the end like that! 😀 He’s still one of my favorites despite everything, and I will not apologize. 😛 CADE.) Even the villains are written in such a compelling way that they seem human too. There was one in particular I hoped for a better ending for, but… ah well. 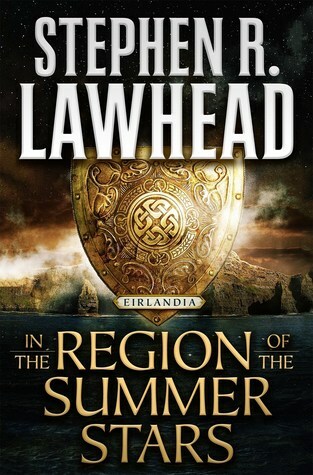 SONG OF LEIRA is a breathtaking, fulfilling, and so rewarding conclusion to what has been a beautiful journey of a fantasy trilogy, masterfully penned and threading its way through my heart. It brings you through the darkest shadows of night and on to the glorious rays of dawn. 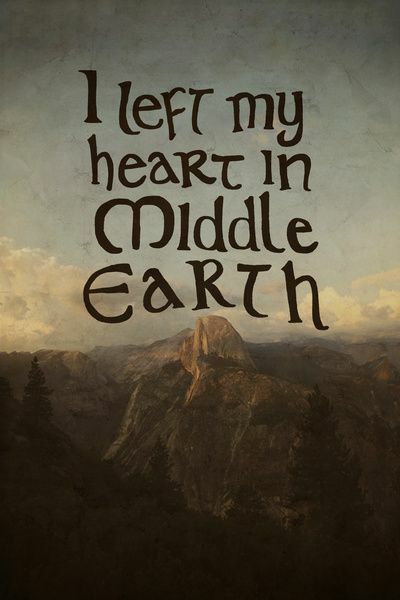 This—THIS—is what epic fantasy with echoes of truth is meant to be. The Song bids her rise to battle. Reeling from her disastrous foray into the Pit, Birdie, the young Songkeeper, retreats into the mountains. But in the war-torn north, kneeling on bloodstained battlefields to sing the souls of the dying to rest, her resolve to accept her calling is strengthened. Such evil cannot go unchallenged. Torn between oaths to protect the Underground runners and to rescue his friend from the slave camps, Ky Huntyr enlists Birdie’s aid. 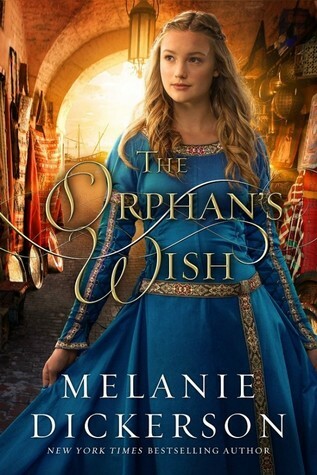 Their mission to free the captives unravels the horrifying thread connecting the legendary spring, Artair’s sword, and the slave camps. But the Takhran’s schemes are already in motion. Powerful singers have arisen to lead his army – singers who can shake the earth and master the sea – and monsters rampage across the land. As Leira falters on the verge of defeat, the Song bids her rise to battle, and the Songkeeper must answer. NEED TO CATCH UP ON THE SERIES? Orphan’s Song (Book 1) Her solo is a death sentence. When Birdie first hears the Song coming from her mouth, her world shatters. She is no longer simply an orphan but the last of a hunted people. Forced on the run, she must decide who to trust: a traveling peddler, a streetwise thief, or the mysterious creature who claims to know her past. With war threatening to tear her homeland apart, Birdie discovers an overwhelming truth: the fate of Leira may hinge on her song. Songkeeper (Book 2) War ravages Leira & the Song has fallen silent. Desperate to end the fighting, Birdie embarks on a dangerous mission into enemy territory, while Ky returns to his besieged city to save the Underground runners. Legend speaks of a mythical spring beneath the Takhran’s fortress and the Songkeeper who will one day unleash it. Everyone believes Birdie is the one. But can she truly be the Songkeeper when the Song no longer answers her call? To see the prizes at stake and the official contest guidelines, head over to Gillian’s website. I’m so excited to share this new release with you guys, today! 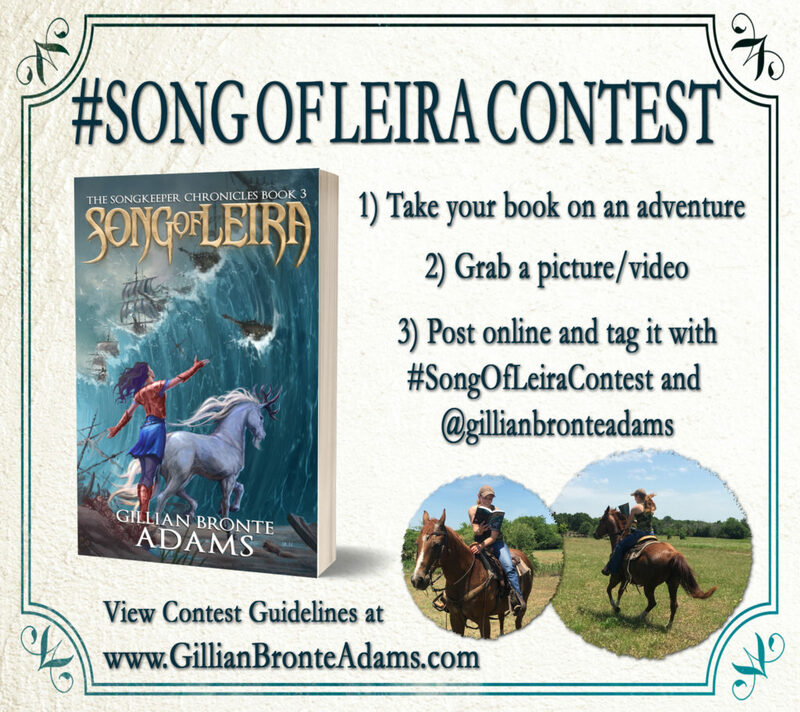 Song of Leira is the third and final book in The Songkeeper Chronicles by Gillian Bronte Adams, an epic fantasy adventure about a place where music is magic and one girl’s song can shape or break the entire world. 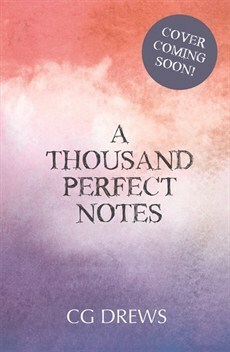 There’s a special invite for you guys at the end, but first, isn’t this cover gorgeous? Gillian Bronte Adams is a sword-wielding, horse-riding, wander-loving fantasy author, rarely found without a coffee in hand and rumored to pack books before clothes when she hits the road. Working in youth ministry left her with a passion for journeying alongside children and teens. (It also enhanced her love of coffee.) Now, she writes novels that follow outcast characters down broken roads, through epic battles, and onward to adventure. And at the end of a long day of typing, she can be found saddling her wild thing and riding off into the sunset, seeking adventures of her own (and more coffee). 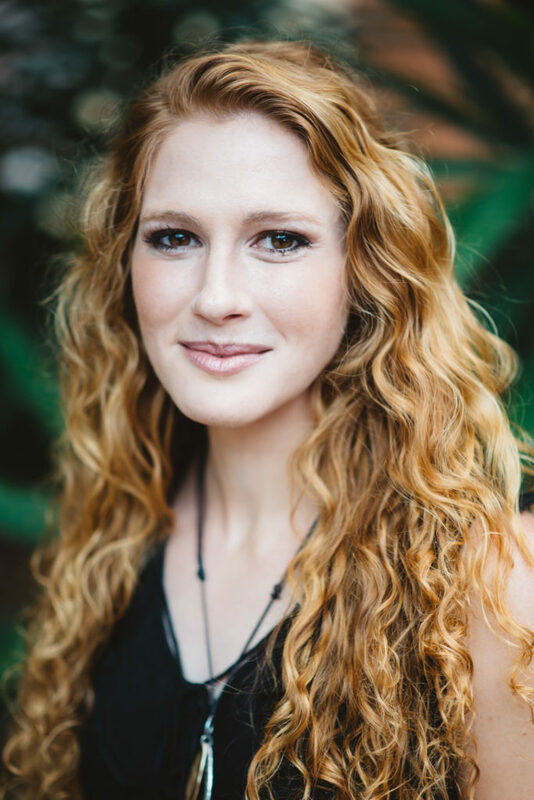 She loves to connect with fellow readers and wanderers online through her blog, Facebook page, newsletter, and Instagram. YOU’RE INVITED TO A PARTY! Speaking of the Facebook party, you’re invited! Have you ever been to a Facebook party before? Gillian Bronte Adams is teaming up with fantasy author Jill Williamson for a special event full of awesome giveaways, prizes, and games! And you are invited to come! Click on the photo or RSVP on the event page. 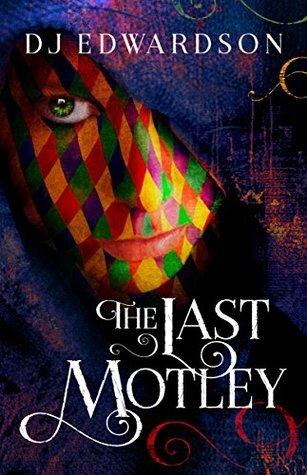 I’ll be back in a couple of weeks to share my review of this final book in this delightful fantasy series, so stay tuned! 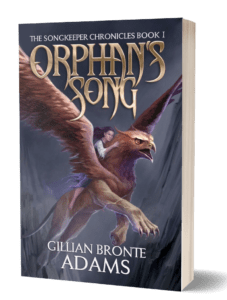 You can read my review for Orphan’s Song here, and for Songkeeper here. And if you’re just as excited about this book as I am, celebrate with me in the comments below because IT’S FINALLY HERE AND THE WAIT IS OVERRR! 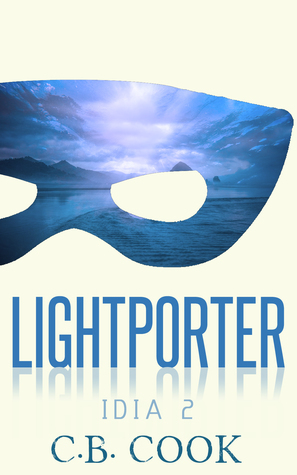 Lightporter – C. B. Cook — (June 16) Gaah, I’ve been excited for this since Twinepathy! Superheroes and awesomeness. And it’s almost here! 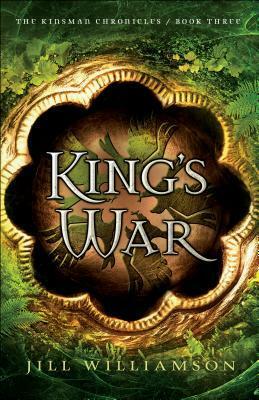 King’s War – Jill Williamson — (June 19) The final Kinsman Chronicles book and I’M NOT READY — aaahh! It’s so thick and gorgeous though and I’m looking forward to reading it! Here, have a smattering of other bookish news! 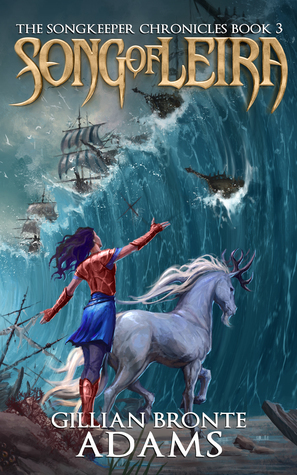 I’ll be part of the blog tours for Song of Leira and Lightporter, so watch for those. I can’t wait! And hopefully I’ll have a few other reviews to share, as well. Hannah Williams just revealed her debut novella releasing in August and I’M SO EXCITED AAH. 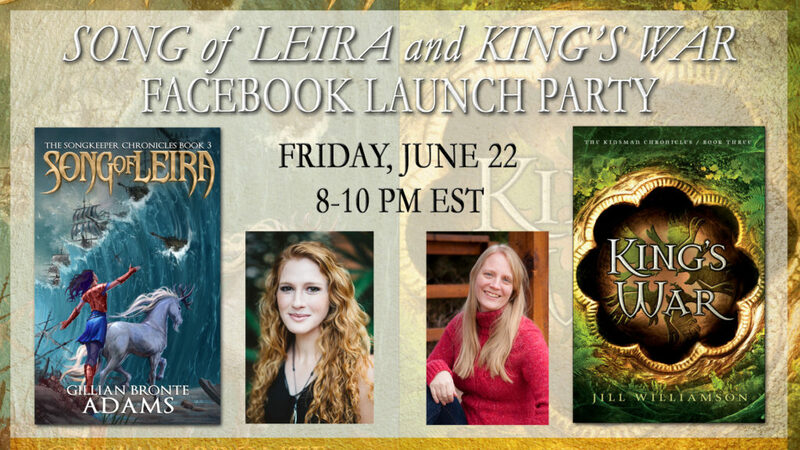 June 22: Jill Williamson and Gillian Bronte Adams are having a joint FB party to celebrate the release of Song of Leira and King’s War. I’m so excited! Oh, and there’s a less-in-depth, but-still-awesome, side version of that for those of us who are technically “adults” even if we’re young at heart! 😉 So check that out. The Summer Reading Quest started just a couple of days ago at the start of June, and it’s going to run through August, so there’s time to get involved and read all kinds of wonderful fantasy. Aaand that’s all I have for you today. I hope you found this helpful or at least vaguely intriguing! 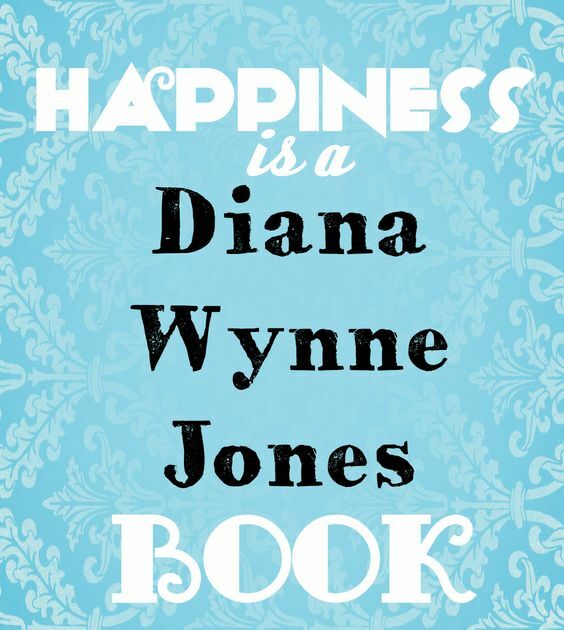 Let me know some bookish things YOU’RE excited about, in the comments! Here are some books coming out this year, hopefully! I have no illusions that I’ll be READING them all this year (there’s ONLY, like, 25 of them… >.> *cough*) but for some reason I keep tabs on books that are releasing soon, so I thought I’d share them with you! 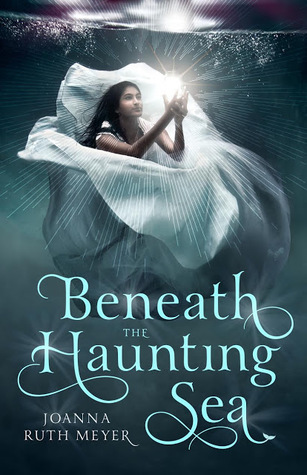 This is by a Twitter friend of mine, who I met through a mutual love for Diana Wynne Jones novels, so I’m curious about her book — it looks really interesting! The dragon Malcolm Blackfire from the Beaumont and Beasley series is getting his own spinoff! Featuring magical artifacts and an interesting jewel thief lady. This is Regency Fantasy and has (I hear) Excalibur, and I COULD NOT BE MORE EXCITED. So excited and so nervous for this one! But mostly excited. XD I love Jet SO MUCH and can’t wait to see what all these characters get up to in the conclusion to a trilogy I read most of last year and loved. 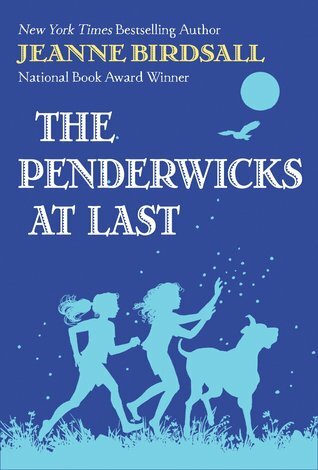 The final Penderwick book… I don’t know how I feel about this. o.o Or about what might happen in it! 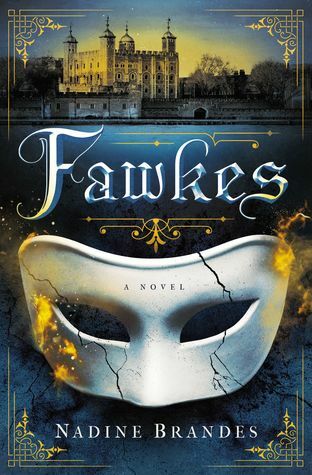 But it’s Penderwicks, so naturally it’s going on my library wishlist! I’ve never read this author before because I can’t stand dystopian, so when I heard she’s branching into a new genre, I became curious to see how this book will turn out! Alternate history/fantasy/gunpowder plot? Definitely sounds fascinating! I’m not caught up on the Ilyon Chronicles by any means, but I do keep up with the releases; I’m curious about Jaye’s modern story too. A Twelve Dancing Princesses retelling set in Renaissance Italy. I definitely want in on this! Continuing the series I started reading in Burning Rose, this is a Twelve Dancing Princesses retelling, so obviously I NEED IT. And there you are! Are you excited about any of these? Are there any I’m missing that you have on your upcoming-releases-I-need radar? Let’s chat about book excitement!! Guys, I’m so excited! 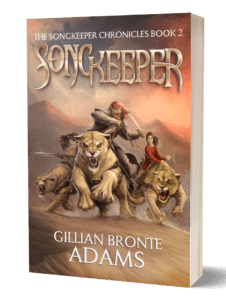 The final book in the Songkeeper Chronicles trilogy by Gillian Bronte Adams has a cover/release date/summary/pre-order link, and I get to share them all with you today! Torn between oaths to protect the Underground runners and to rescue his friend from the slave camps, Ky Huntyr enlists Birdie’s aid. 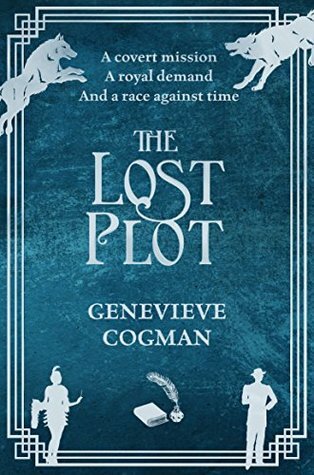 Their mission to free the captives unravels the horrifying thread connecting the legendary spring, Artair’s sword, and the slave camps. But the Takhran’s schemes are already in motion. Powerful singers have arisen to lead his army—singers who can shake the earth and master the sea—and monsters rampage across the land. 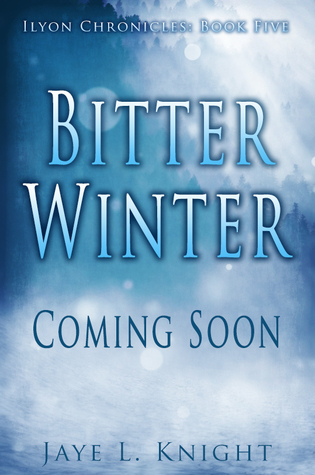 AND NOW… *DRUMROLL* … THE COVER! Isn’t it beautiful? *collapses* I. can’t. wait. WHAT DO YOU THINK? ISN’T IT SO PRETTY? Have you read either of the first two books? Talk to me, friends! 1: January Garnet: Name a character that you think is evil/dark. Rupert de la Mare from Plenilune by Jennifer Freitag. He’s my go-to villain for questions like this. 2: February Amethyst: Name a book you think of as regal. 3: March Aquamarine: Name a character you think of as weak, or as more of a follower. Catherine Morland from Northanger Abbey is more of a follower, methinks. 4: April Diamond: Name a book that you love, but isn’t very well known. 5: May Emerald: Name two characters who balance each other out. Jonathan and Lockwood from Illusionarium by Heather Dixon. Jonathan’s all smart and cautious (usually) and Lockwood’s daring and reckless. Plus they just make an excellent pair. 6: June Pearl: Name a character that is loyal. Ky from Orphan’s Song and Songkeeper by Gillian Bronte Adams. ❤ HE IS SO INCREDIBLY LOYAL. It’s the best. 7: July Ruby: Name a book that aggravates you/makes your blood boil. The End by Lemony Snicket, final book in A Series of Unfortunate Events. Just… NO. 8: August Peridot: Name a supporting character you preferred to the main character. 9: September Sapphire: Name a book that you found to be calming. The Railway Children by E. Nesbit. Love that one! 10: October Opal: Name a book with a pretty cover. 11: November Topaz: Name a book with a resilient protagonist. 12: December Blue Zicron: Name a fictional friendship you would love to be a part of.